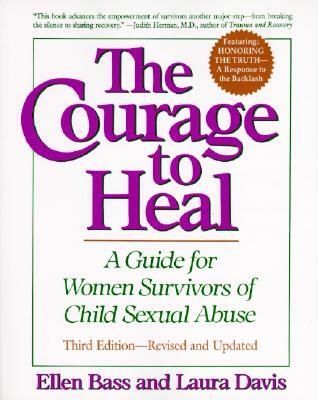 "The Courage to Heal" is an inspiring, comprehensive guide that offers hope and encouragement to every woman who, was sexually abused as a child -- and those who care about her. Although the effects of child sexual abuse are long-term and severe, healing "is" possible. The authors weave personal experience with professional knowledge to show the reader how she can come to terms with her past while moving powerfully into the future. They provide clear explanations, practical suggestions, a map of the healing journey, and many moving first-person examples of the recovery process drawn from their interviews with hundreds of survivors.Definitive in scope, "The Courage to Heal" speaks directly to the survivor in a warm and personal way: TAKING STOCK -- outlines the effects of child sexual abuse and the ways women cope over time.THE HEALING PROCESS -- explores each stage from the decision to heal and remembering through breaking silence, knowing it wasn't your fault, nurturing the inner child, and grief and anger, to resolution and moving on.CHANGING PATTERNS -- offers in-depth guidance for shifting self-defeating patterns in specific areas of one's present life, including self-esteem, feelings, intimacy, sexuality, and dealing with families.SUPPORTERS OF SURVIVORS -- provides insight and strategies for partners of survivors, family members, and counselors.COURAGEOUS WOMEN -- profiles survivors who share the challenges and triumphs of their own healing journeys.HONORING THE TRUTH -- a substantial new Afterword that refutes the "false memory" argument and presents a thorough and enlightening response to the backlash.RESOURCE GUIDE -- fully updated for this edition -- informs readers abouttherapy, healing activities, recommended reading, support groups, self-help programs, and services and organizations.